To the hono[u]rable Justices of the great Sessions Houlden in Wrexham for the County of Denbigh the 20th of September 1652. To the Honourable Justices of the Great Sessions held in Wrexham for the county of Denbigh the 20th of September 1652. 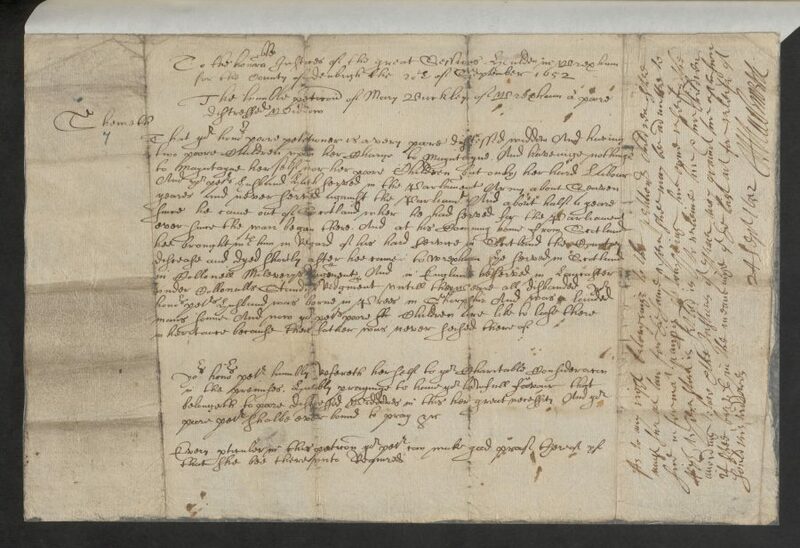 The humble petition of Mary Buckley of Wrexham, a poor distressed widow. That your Honours’ poor petitioner is a very poor, distressed widow and, having two poor children upon her charge to maintain, and having nothing to maintain herself nor her poor children but only her hard labour. And your petitioner’s husband has served in the parliament’s army about seven years and never served against the parliament. And about half a year since, he came out of Scotland, where he had served for the Parliament ever since the war began there. And at his coming home from Scotland, he brought with him in regard of his hard service in Scotland the country disease, and died shortly after he came to Wrexham. He served in Scotland in Colonel Milevery’s regiment, and in England he served in Lancaster under Colonel Standish’s regiment until they were all disbanded. Your Honours’ petitioner’s husband was born in Prees in Shropshire and was a landed man’s son. And now your petitioner’s poor sh children are like to lose their inheritance because their father was never in possession of his lands. Your Honours’ petitioner humbly refers herself to your charitable consideration in the premises, humbly praying to have your lawful favour that belongs to poor distressed widows in this her great necessity. And your poor petitioner shall ever be bound to pray etc. Every particular in this petition your petitioner can make good proof thereof, if that she be thereunto required.